We have been busy sorting out the new speakers and exhibitors for the Meeting of Minds Conference this November. Ticket sales are going well with three quarters as many tickets sold already as we had for the whole of the conference in 2014! We are delighted to announce Mark Littlejohn, Len Metcalf and Julian Calverley to add to our already outstanding list of speakers. The early bird ticket offer of £195 runs out on the 31st March, so if you are thinking of coming, we recommend you book before then. Our promise to our readers is that the there will be other offers throughout the year but there will never be an offer as good as this early bird one. For more details about tickets click here. We still have some places left for our lightning talks where we are asking delegates to do a presentation over lunchtime. A lightning talk is a very short presentation lasting only a few minutes. Over the lunch time on the Saturday and Sunday we are inviting our community of photographers to talk about a project they are working on or an idea. Each slot is 10 minutes and there will be 5 slots per day. If you're interested in presenting a lightning talk, please get in touch. Even if you're not quite sure of the idea, but fancy having a go - do get in touch as we're anticipating this will be quite popular! 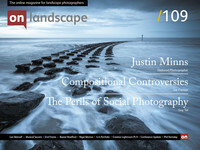 In our next issue we will be announcing our On Landscape Photographic Exhibition which will be in the gallery space at The Rheged and will run over the weekend of the conference. So stay tuned! The abstract photograph of Glencoe that won him the Landscape Photographer of the Year title may have been a controversial win but his portfolio of stunning Lake District photography is without doubt both classically beautiful and yet distinctly original. Is the founder & head teacher of Lens School, Australia. Len is renowned for his exquisite black & white photographs capturing diverse Australian landscapes, from arid deserts and windswept coasts to his backyard in the Greater Blue Mountains World Heritage Area. Find out more about Len. Has been creating imagery in one form or another since he was old enough to hold a paint brush. He has many years experience as a photographer. At home both in the studio and on location, shooting people, landscape, lifestyle, automotive and underwater. Find out more about Julian. As the UK importer and specialist retailer of Large Format Digital & Analogue Solutions, Linhof Studio are pleased to be supporting the first ‘Meeting of Minds’. We will be showing both 5x4 and digital camera systems. Complementary products such as Lee Filters will also be available. We pride ourselves on our reputation for knowledge and service to assist the photographer to make the right choice and decisions around their equipment needs. We hope to engage with many of you in lively debate and answer any questions you may have. Fotospeed utilises its wealth of expertise to produce a comprehensive range of award winning digital fine art and photographic inkjet papers, inks and accessories. We will be showcasing their range of award winning inkjet papers and will have live printing demo’s throughout the show. We will have printing experts on hand throughout “A Meeting of Minds” to answer any questions you may have about paper choice, colour management and printing. Trailblazer is a proudly independent, family owned business based in Pickering - on the southern edge of the North York Moors National Park. All the staff are involved in outdoor activities - walking, climbing, bushcraft, wildlife watching, and of course landscape photography. As such we are well placed to advise on what works well in outdoor clothing and footwear, and what should be avoided..! Come to our stand at ‘A Meeting of Minds 2016’ to meet John and Neil, and see the latest additions to the Paramo range of waterproof directional clothing and winter insulation. We’ll also have practical solutions for carrying your photographic gear from F-Stop, and the best wellies on earth from Le Chameau. New lightweight clothing options from British manufacturers True Mountain and Troll will be on show, alongside Hillsound Trail Crampons, and Bridegdale Socks - great additions to any outdoor photographer’s year round kit. And why not come for a chat about maintaining your current outdoor clothing - to keep it weatherproof and performing well throughout the coming winter season. After all, if you look after your kit, it will look after you..! Our special show offers from Nikwax will help you get the best out of your outdoor gear, and stay comfortable and dry inside it. If you need advice before or after the conference, you can find us on the web at www.trailblazeroutdoors.co.uk, or contact us by phone on 01751 475183. Better still, come and visit us in Pickering for boot and shoe fittings from our great range of footwear from Le Chameau, Scarpa, Zamberlan, Gris Sport, Salomon, Keen, Hi-Tec, and Trekstar. After 12 years trading as a shop in Edinburgh, Beyond Words now operates as a mail order/online business. We scour the planet looking for the finest photographic titles from a wide range of publishers. Many of our most popular books come from Nazraeli Press, Steidl, Hatje Cantz and from small publishers across the globe. We have a reputation as a source for limited editions and signed copies.